It was about a year ago today that I started a major kitchen re-haul (really a few hours) before throwing a surprise party in my apartment. I say started because, while everything was put back into some kind of order, I don’t think it was really finished until this week. Faced with the potential embarrassment of friends seeing my apartment in shambles, I made miracles happen and then took some time off (about 12 months to be exact). Most of the elements were in place but crowded, and I hadn’t gotten around to tying it all together. Ending my record breaking game of kitchen Jenga, I finally reorganized my cabinets and closets to free up some storage, found a permanent home for my favorite serving dishes, cleared up shelf space for newer cookbooks, and chose a color for the doors and window trimmings (black beauty with a pearl finish). My spice jars are labeled and newly potted plants are thriving (for now). These changes might seem minor to anyone but me, but the kitchen is breathing easier. One of the benefits of my spring cleaning fit is that I can actually see everything. Instead of going off with a list and debit card every time I find a new recipe, I’ve been using what I have. For me this starts with Truly Mexican by Ricardo Santibañez and JJ Goode. I love the way the book’s galleries and guides break down the ingredients so I start from there and see where it will take me. His suggestion to chop cilantro the Mexican way, using stems and leaves to make up the called for amount, is game changing. I also like that he gives equivalent amounts for kosher and fine salt – a distinction I didn’t realize was tripping me up. 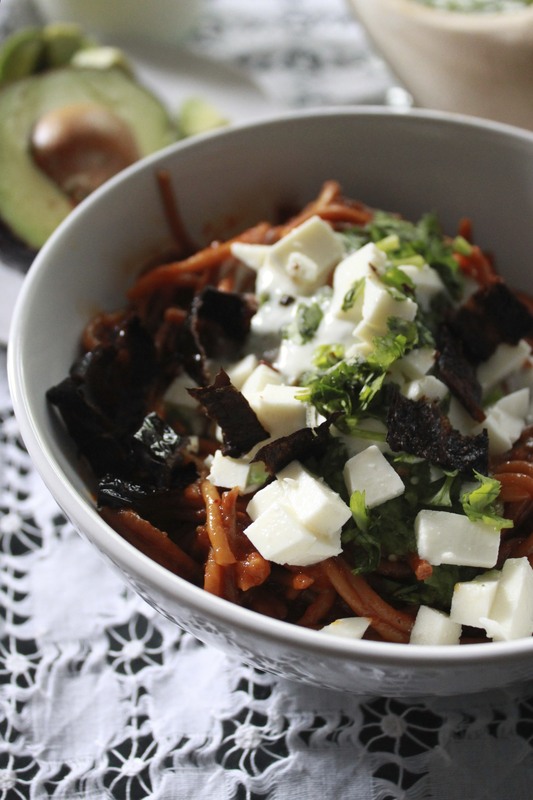 Looking at chiles I had stored and the bag of fideos – thin nests of Spanish noodles – I’d bought a few weeks earlier , I decided to try his fideos secos (also known as sopa seca). I’m always a little in awe of Mexican recipes and this one seemed to go long – first you prepare a tomato based chile sauce, then you quickly fry the noodles, then you bring it to a boil with large amounts of chicken stock until most of the liquid evaporates. 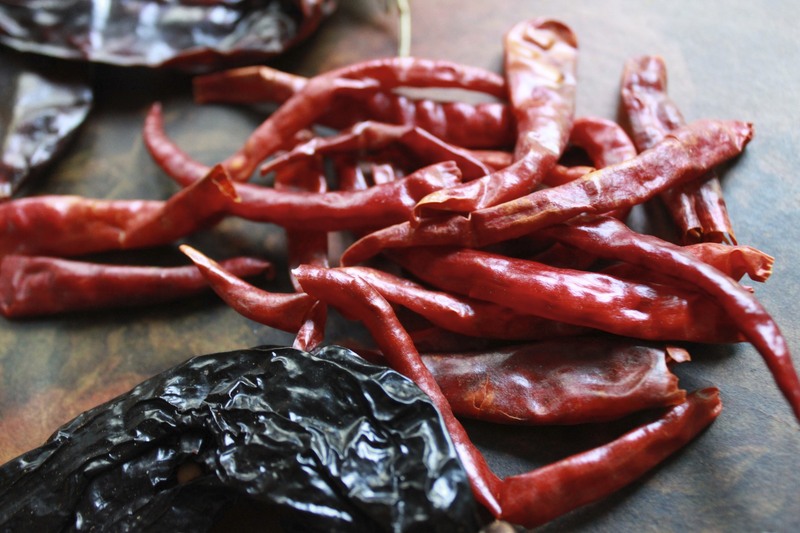 Something like playing with fire, it called for four different kind of chiles (árbol, ancho, guajillo, and pasilla) prepped in three different ways – toasted, soaked and fried. Each step added a new element of smoke or heat not to mention spices like cumin, oregano and oregano and fresh herbs like cilantro, parsley, and mint. I enjoyed them so much that after a stressful week, I decided to make it a second time. With my kitchen decks cleared, I could just enjoy the process. Of course I still have a new dish drainer to install and window blinds for the kitchen to get but there’s time. Barely adapted from Truly Mexican: Essential Recipes and Techniques for Authentic Mexican Cooking by Ricardo Santibañez. This really is a wonderful guide through some pretty intimidating recipes so I followed it closely. I love the selection of garnishes he suggests but replaced the pork chicharrón with cured Spanish chorizo that I lightly browned before the final simmer. I made slight adjustments to the time probably due to my broiler which is set up too close to the heat source. Because I usually find fideos in smaller bags, I also adjusted the amount of chicken stock I added to the end but kept the sauce proportions for the sauce. This dish can be reheated with a little chicken broth and keeps well, wrapped and refrigerated over several days. Prepare the sauce: Line a small roasting pan or rack with foil. Preheat the oven broiler (alternately preheat the oven to 500º) and position the rack 8 inches from the heat source. Core the tomato and cut a small “X” on the opposite end. Put the tomato, cored side up, árbol chiles, and tomatillos on the baking pan and roast. Remove chiles quickly after they’ve browned and blackened in spots, about 3-5 minutes. Continue to roast the tomatoes until cooked through and blackened and the tomatillos have turned a khaki-green color, turning halfway through, 20 to 30 minutes. Slip the skin from the tomatoes. Meanwhile, soak the guajillo and ancho chiles with the toasted árbol chiles in cold water to cover until softened, about 30 minutes. Drain and discard soaking water. In a blender jar, combine the chiles, tomato, tomatillos, onion, garlic, canela, cumin, oregano, salt, and sugar with 1 1/2 cups of chicken stock. Process until smooth, about 3 minutes. Strain through a medium mesh-sieve into a bowl, discarding any solids. Set the sauce aside. Prepare the noodles: Break the noodles into 2- to 3-inch pieces (wrap in a cloth or break inside the bag so the pieces don’t scatter). Heat the oil in a wide 6- to 7-quart heavy pot set over medium high heat until it shimmers. Fry the whole pasilla chiles in the oil, turning once or twice until puffed and crisp, about 1 minute total. Transfer to paper towels to drain. When cool, slice the chiles crosswise and reserve for garnish. 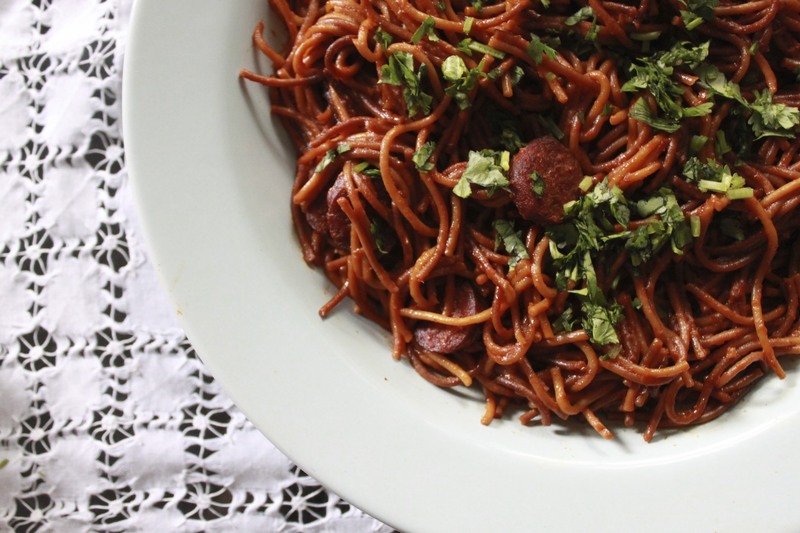 Working in batches, fry the noodles in the oil, stirring constantly with tongs until they are a reddish-golden brown, about 2 minutes. Drain on paper towels and repeat with remaining noodles. Remove all but 2 tablespoons of the oil from the pot. Add the chorizo if using and cook until lightly browned, 2 to 3 minutes. Remove from pot and set aside. Off heat, carefully pour the sauce into the pot (it may steam and sputter). Return to medium heat and stir until it thickens slightly, about 5 minutes. Stir in 3 cups of the chicken stock, then add the fried noodles, stirring briefly to coat them with sauce, and bring to a boil. Tie the cilantro, parsley, spearmint, and canela into a bouquet with kitchen string and drop into the pot. Reduce the heat to medium-low, cover the pot, and simmer the noodles until they are tender and have absorbed the sauce. Discard the bouquet of herbs and canela. Serve in soup bowls with crumbled queso fresco, crema, salsa verde, cilantro, avocado and fried pasilla. 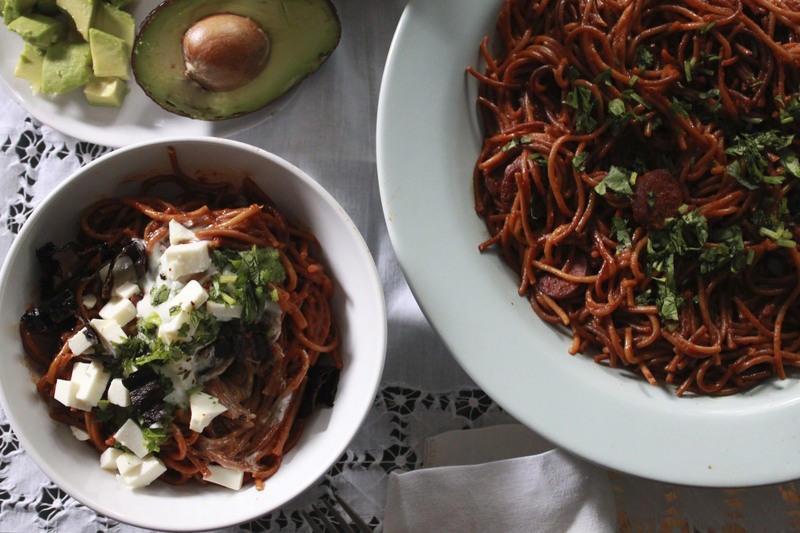 These fideos have delicious and comfort written all over them.